^ Gerson, Allan (1 January 1978). Israel, the West Bank and International Law. Psychology Press. ISBN 9780714630915. Mansour, Antoine (2015). "The West Bank Economy: 1948-1984". In Abed, George T. (ed.). The Palestinian Economy: Studies in Development under Prolonged Occupation. Routledge. pp. 71-. ISBN 978-1-317-59291-4. Mishal, Shaul (14 July 2014). 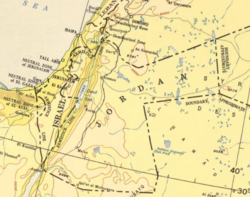 "Conflictual Pressures and Cooperative Interests: Observations on West Bank - Amman Political Relations, 1949-1967". In Joel S. Migdal (ed.). Palestinian Society and Politics. Princeton University Press. pp. 169–. ISBN 978-1-4008-5447-9. This page was last edited on 2 April 2019, at 03:22 (UTC).